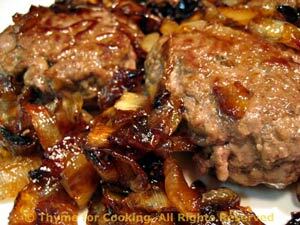 Beef Patties with Caramelized Onions, Thyme for Cooking main course. We use 10oz and make 2 nice burgers. If you want more meat just increase everything else (not the caramelized onions) proportionately. Mix bread crumbs, mustard, red wine, garlic powder and thyme. Add beef and mix thoroughly - hands are best. Shape into 2 or 3 patties. Cut onions in half then into 1/4 inch (.65cm) think slices. Heat butter in large nonstick skillet over medium heat. Add onions, cover and cook for 5 minutes. Uncover onions and sauté until browned, stirring frequently, another 15 minutes. Add patties (moving onions out of the way but leave in pan) and sauté 5 - 7 minutes per side. Remove burgers and keep warm. Add sugar and mustard to onions and stir until well blended and sugar is melted. Spoon over burgers and serve.